SUNRISE, Fla. – The Colorado Avalanche Hockey Club made seven selections at the 2015 NHL Draft held Friday and Saturday at BB&T Center in Sunrise, Fla. Following is a complete list of the Avalanche's selections at the 2015 NHL Draft. Colorado picked four forwards and three defensemen at this year's draft. The Avs selected three players from the Quebec Major Junior Hockey League and one apiece from Finland, Russia, Sweden and the NCAA. 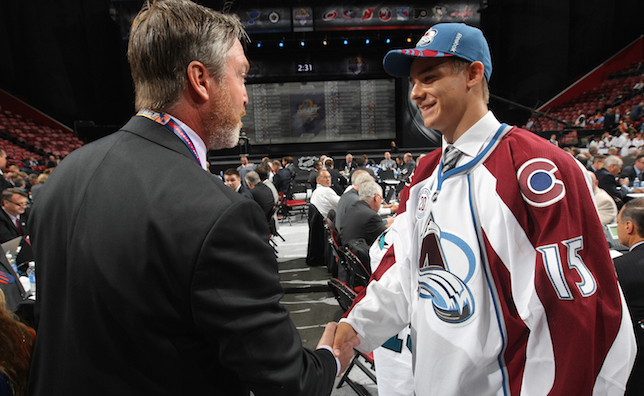 During the first round on Friday, the Avalanche selected forward Mikko Rantanen with the 10th overall pick. Rantanen, 18, was the No. 1 rated international skater in NHL Central Scouting’s final rankings for the 2015 draft. He recorded 28 points (9g/19a) in 56 games for TPS in the Finnish Elite League (Liiga) last season while serving as an alternate captain. The Nousiainen, Finland, native also played for the TPS junior club during the 2014-15 playoffs, helping the squad win the league championship with 14 points (6g/8a) in seven contests. Rantanen was given Best Player honors by the league for his postseason success. The 6-foot-4, 211-pound right wing played for Finland at the 2015 IIHF World Junior Championship in Toronto/Montreal, recording four goals in five games during the tournament. 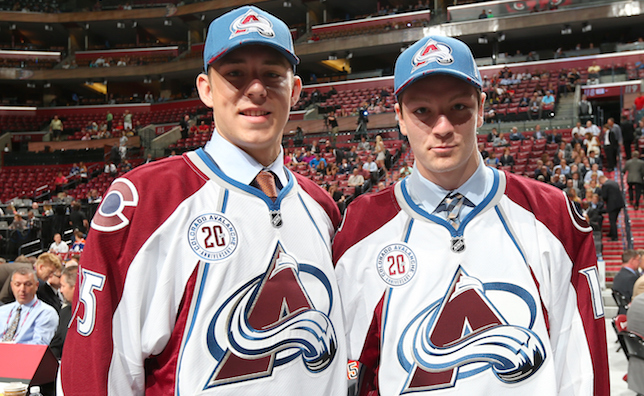 Rantanen’s international experience also includes representing his nation at the 2014 Under-18 World Championship. In addition, he tallied seven points (2g/5a) in five games at the 2014 World Under-17 Hockey Challenge and led Finland with seven points (3g/4a) in five games at the 2013 Ivan Hlinka Memorial Tournament. Colorado held back-to-back second round picks following a trade with the San Jose Sharks in which the Avalanche obtained the No. 39 overall selection, a second-round pick in 2016 and a sixth-round choice in 2017 in exchange for the No. 31 overall pick (acquired Friday from the Buffalo Sabres). Both of the future picks were previously owned by the Avalanche. With the first of its consecutive choices, Colorado tabbed left wing Anthony-John (A.J.) Greer from Boston University at No. 39 overall. At 6-foot-3 and 204 pounds, Greer, 18, was the youngest forward in the NCAA in 2014-15. The Joliette, Quebec native ranked third among freshmen forwards on the team with seven points (3g/4a) in 37 games and scored a goal in the Terriers’ NCAA Frozen Four semifinal win against top-ranked North Dakota. Prior to attending Boston University, Greer spent two years at Kimball Union Academy and posted 92 points (39g/53a) in 61 contests. For its second selection in the second round and 40th overall, Colorado chose defenseman Nicolas Meloche from Baie-Comeau of the QMJHL. Meloche led all team defensemen in goals (10) and ranked second in both assists (24) and points (34) this past season despite playing in only 44 games. The LaSalle, Quebec native added 10 points (4g/6a) in 12 playoff contests. Meloche set a Drakkar franchise record for points by a rookie in 2013-14, when he collected 25 points (6g/19a) in 54 games and earned a spot on the QMJHL All-Rookie Team. Internationally, the 6-foot-2, 204-pound blueliner won a gold medal with Canada at the 2014 Ivan Hlinka Memorial Tournament and also represented Team Quebec at the 2014 World Under-17 Hockey Challenge. Colorado chose center Jean-Christophe Beaudin of Rouyn-Noranda of the QMJHL with the No. 71 overall pick in the third round. Beaudin, 18, led all Huskies rookie skaters in goals (14), power-play goals (5), assists (39) and points (53) while appearing in all 68 regular season games in 2014-15. The 6-foot-1, 181-pound native of Longeuil, Quebec added five points (1g/4a) in six postseason contests. Defenseman Andrei Mironov of Russia was the Avs’ fourth-round section (101st overall). The Moscow native spent the past three seasons with Dynamo Moscow of the Kontinental Hockey League where he totaled 23 points (8g/15a) in 138 regular season games. The 6-foot-2, 194-pound rear guard also added five points (1g/4a) in 36 postseason outings over that span. Mironov, 20, represented Russia at the 2013 and 2014 IIHF World Junior Championships, helping his native country earn a bronze medal at both events while contributing six points (2g/4a) in 14 contests. During the sixth round the Avalanche tabbed Drummondville (QMJHL) defenseman Sergei Boikov with the No. 161 overall selection. Boikov, 19, finished second among Voltigeurs blueliners in assists (18) and points (21) and posted a team-best +11 plus/minus rating while appearing in 64 games this past season. In 2013-14 the 6-foot-2, 195-pound blueliner paced all Drummondville rookie defensemen in assists (10), points (12) and plus/minus (+11) while skating in all 68 games. On the international scene, the Khabarovsk, Russia native represented his home country at the 2013 Ivan Hlinka Memorial Tournament. The Avalanche’s final selection (seventh round, 191st overall) was 6-foot-6, 213-pound center Gustav Olhaver. The Angelholm, Sweden native spent the majority of the 2014-15 campaign with Rogle Jr. (Under-20) in Sweden, where he tallied 12 points (6g/6a) in 41 games. Olhaver, 17, also spent time with Rogle’s Under-18 Team, recording 25 points (14g/11a) in 18 contests. Internationally, he appeared in five games at the 2015 IIHF Under-18 World Championship and tallied one goal.